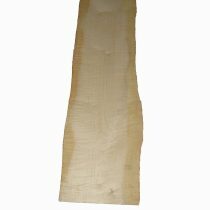 Sycamore, similar to maple in color, is usually quarter-sawn with a disctinctive fleck appearance. It mainly grows in Canada and the USA. Sycamore varies in color from white or light tan which is mainly the sap wood to a darker reddish brown characteristic of the heart wood. The grain is fine and even in texture with small to medium pores. Common uses of sycamore is interior trim, plywood, veneer, flooring, furniture, particleboard, paper (pulpwood), tool handles, and other turned objects. Sycamore is mainly an interior wood and does not have rot resistant characteristics.